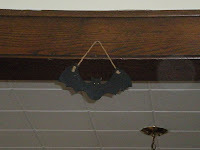 Bitter~Sweet ™: A quiet Halloween at home . . . . So November is here. 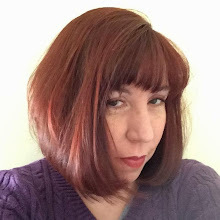 And I've decided to give NoBloPoMo a shot. I'm not sure I can post every day for an entire month but I'd like to give it a try. 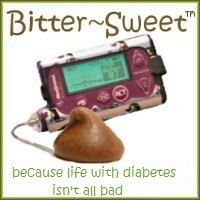 I am sure that some posts may be about things other than diabetes. 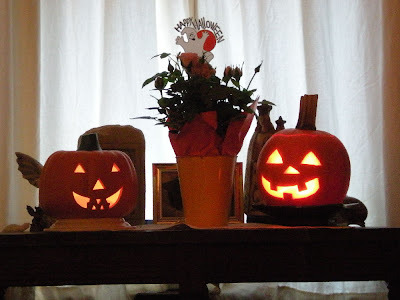 Today, for example, is about my quiet Halloween at home with Sweetpea! On Friday I was thinking about how busy and stressed Pete has been at work. 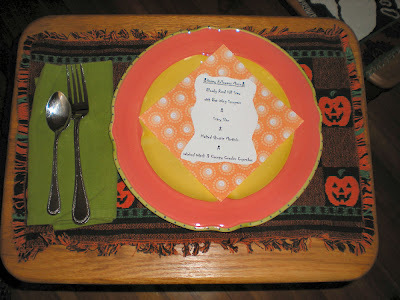 And I decided to throw together a little Halloween "party" for the two of us. As soon as he left for his haircut yesterday I sprang into action, printing out a menu card and shopping for our supplies. The menu included "Bloody Road Kill Stew with Bat Wing Scoopers" and "Scary Slaw" - which was really Turkey Chili with Blue Corn Chips and Broccoli Slaw. With the menu ready to go, the next step was to put out a few decorations . 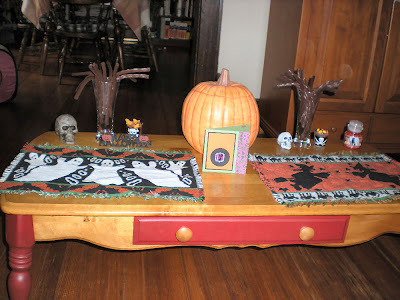 . .
and get the coffee table looking festive and ready for some treats! 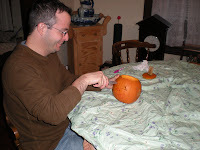 You can't have Halloween without a Jack-O-Lantern, so pumpkin carving was up next. 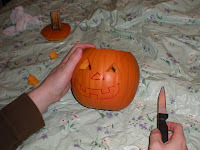 I drew the face and Pete carved little Jack up while I roasted the seeds we had scooped out. Once the sun went down it was time to light up the pumpkins - the one we made and the ceramic one that makes an appearance every year. Next up? 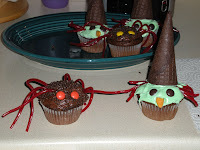 A little cupcake decorating, of course. 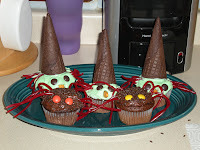 Our witches and spiders weren't as cute as the ones I saw on the dessert web-site I had found, but they were pretty good and they tasted great! I would have rather given the spiders black legs, but after searching five stores without being able to find black licorice strings we decided red legs would have to do. Decorations up, food prepared, pumpkin carved . . . . what's left? Just to settle in on the couch for the spooky feast! 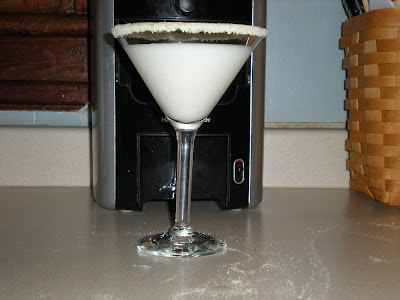 Oh, and maybe a little drink. 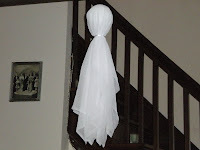 What's better on Halloween than a Ghost-ini? You're never too old for a fun and festive Halloween! Wow, that was a lot of party preparation. I cannot look at a pumpkin without thinking of several years ago when I went to a fall dinner at a friends. She was a real Martha Stewart type person and served a beef stew in a hollowed out pumpkin. As people helped themselves, then were scooping out some of the pumpkin flesh and eventually the shell got very thin and the entire thing broke and most of it went into my lap. Awesome Party! I need to move Closer to you! I need some of your creativity to rub off on me. If I ever get rich and throw a party, I'm totally hiring you! I don't know how you did all that in one day! It would seriously take me a week to organize all that! I haven't officially decided to do NaBloPoMo because I just don't think I have it in me to do it, but so far I'm off to a good start. Of course, it's only the 2nd... well, technically, the 3rd, and I have the art therapy conference and the art therapy exam in 2 weeks so if I complete it, it will be a heck of a lot of puff posts with pictures of lizards , and whatever else I can do quickly and mindlessly. I don't know, might be better to not post at all than embarrass myself by revealing exactly how boring my life really is, LOL!